Texas has reached a new age in politics. In an overwhelmingly red state, it has become increasingly more difficult for Democrats and outspoken liberals to become elected to the Texas Legislature to represent citizens in Austin. The majority of the state is outspokenly Republican, with a majority of those Republicans being outspokenly conservative. The main roadblock to conservative legislation in the Texas Legislature is not the Democrats; the “Republicans” hold the majority in both the House and Senate. The question is then posed: Why can’t conservative advocacy groups pass their conservative legislation with such “conservative” leadership? How is it possible that 98 Republican Texas State Representatives (out of 150 House members) cannot pass critical pieces of conservative legislation? It seems that more and more moderates and liberals are running under the guises of conservative Republicans. Many of these fraudulent conservatives are forced to vote conservatively on critical pieces of conservative legislation in order to maintain their public appearance within their conservative House District. However, you will rarely see these “representatives” advocating for and championing these key pieces of legislation that would assist Texas in becoming an even greater state. A prime example of this is Texas State Rep. John Raney. Ever since his election to House District 14 in 2011, Representative Raney has grown closer to House Leadership and farther from the conservative base in his district. House Leadership has become the single largest roadblock to conservative legislation passing in the Texas Legislature, and Representative Raney has not aided in alleviating this issue. For example, House Leadership was instrumental in obstructing THSC’s efforts to reform Senate Bill 206 in order to curtail an enormous increase of power that the bill was giving to CPS over Texas families. House Leadership reportedly threatened conservative State Representatives who sought to fix the bill by implying that Leadership would use procedural tricks to kill the pro-life bill and the pro-gun bill behind SB 206 on the calendar if anyone tried to amend SB 206. As a result, amendments to the bill were pulled and the reforms failed to get on the bill. 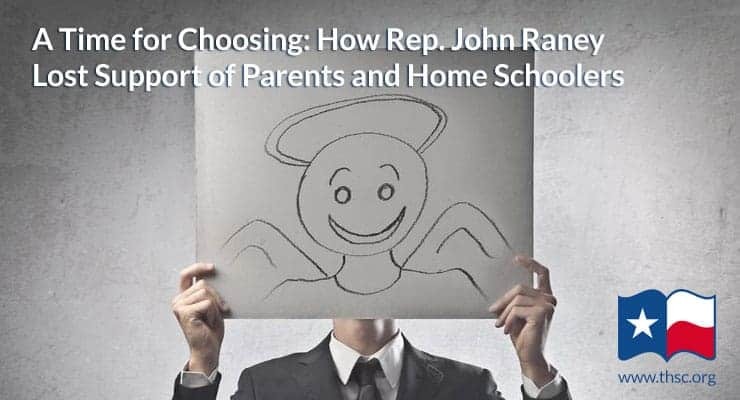 Representative Raney did nothing to aid THSC in furthering or strengthening parental or home school rights during the legislative session, despite many visits to his office regarding these important issues. In addition, Representative Raney earned alarmingly low scorecard ratings from Empower Texans and Texas Right to Life on his lack of defense for conservative fiscal issues and his failure to defend the unborn. It is a critical time for parental rights and home school rights in our state, and it is no longer acceptable for so-called conservatives to simply vote for conservative legislation under pressure of what the public will think. Texas needs legislators who actually agree on and advocate for conservative principles and values. Parents, home schoolers, and conservatives need advocates in Austin to accurately represent them in the Texas Legislature. It is for this reason that THSC has endorsed Jess Fields for Texas House District 14 over Rep. John Raney. Jess is a strong advocate for conservative values, who will accurately represent his constituents in Bryan and College Station, Texas. As a father and husband, Jess will push to expand parental and home school rights in Austin as he fights with us to Keep Texas Families Free. Will you vote for Jess? Have you registered to vote? The deadline is fast approaching! When you vote, will you know whom else to vote for? Check out all the THSC endorsements to Keep Texas Families Free, and sign up for email notifications to be included in our newest endorsements. I was horrified to see the THSC endorsement of Bryan Slaton. I am a homeschooling parent, and have actively served in our county’s GOP club for 4 years. I have supported Dan Flynn in past elections and my homeschooling family will continue to do that. We have gotten to know both men personally through our political involvement. Dan has been an advocate of and friend to homeschooling, and an outspoken supporter and author of conservative bills relating to the saving of pre born, constitutional right to bear arms, right to sell & purchase raw milk and has been one of the finest examples of Christlike servanthood I have seen as he personally aided families in our county affected by tornados. Bryan Slaton has only recently become visibly active in our community, particularly with respect to pro-life activism and is being deemed more conservative based on his profession of his views. The fact that he verbally opposed the TTC hardly makes him more conservative than Dan Flynn. I sure wish we would focus on the TRULY LIBERAL REPUBLICANS instead of hacking away at proven conservatives. If the money spent attacking good men like Dan were spent unseating Joe Strauss and his actual liberal cronies instead maybe we could get somewhere. Michelle, Sorry you feel that way. I would point out that Dan is one of Strauss’s leaders and has become part of the problem. We are also working to replace Strauss but unfortunately Dan and others have become part of the liberal leadership team that Strauss is using. By the way, Dan did not respond to our requests for help on our legislative agenda to protect parental rights. As we say in Texas, talk is cheap! This was very informative and explained well the issues at stake. Because of this article I have personally reached out to family members in this particular district and asked them to vote to protect our rights as parents and as families.